Caftan Woman: Boo! Let's recall Hitch on this special day. Alfred Hitchcock was born on August 13th. Happy Birthday! According to astrology this Leo baby gravitates toward the unique, the strange, the unusual because it allows him to play out his own inner conflicts. For many of us our first memories of Hitch might be his weekly television show and his droll introductions to a variety of frightening and funny stories. 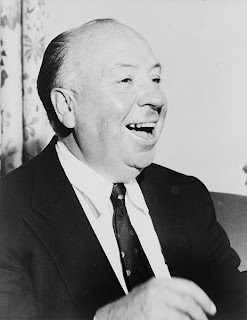 Hitchcock is a director who entertains the masses while moving critics to search for superlatives. He shocked, fascinated, confounded and entertained audiences in his long, prolific career and will continue to do so. I'm crazy about the guy and the titles of some favourites explain why. North by Northwest (1959), the ultimate chase and cinematic offspring to The 39 Steps (1935). Rear Window (1954) that tests and mocks the movie-goers voyeurism. The wonderful character studies in Lifeboat (1944). The exuberant joy of The Lady Vanishes (1938) and the terror of happenstance in Strangers on a Train (1951). Murder most civilized in Dial M for Murder (1954) and the cheeky The Trouble With Harry (1955). The tortured minds of Uncle Charley in Shadow of a Doubt (1943) and Norman Bates in Psycho (1960). Today I am not going to encourage you to rewatch your favourite Hitchcock or seek out a new one in celebration. I want to turn your attention to the late American author George Baxt (1923 - 2008). A prolific mystery writer of a unique sensibility Baxt wrote a series of novels wherein Hollywood celebrities became detective protagonists (Bette, Bogie, Powell & Loy, Gable & Lombard, Astaire & Rogers, Dorothy Parker, Tallulah Bankhead). His take on Hitch as he and wife Alma become mixed up with spies is an absolute delight in The Alfred Hitchcock Murder Case, published 1986. Discover a new classic and bake a cake with a file in it. Great post...Hitch is one of my first loves of classic film. I will likely celebrate by watching episodes of Alfred Hitchcock Presents online. Good evening, Caftan Woman. I believe Hitch would have delighted in your observations. He probably would have taken credit for them as well, for wasn't it he who inspired you to such superlatives. Long live all things Hitch! I had a dream about Hitch about 15 years ago. I was in the desert and he walked up to me and sat down on a small hill. He had the body of an ostrich. Hey, I said it was a dream! Anyway, he told me about a screenplay that he was working on before he died. He said that he'd hidden it away the night before he died and that no one would ever find it. He said that it was to be his masterpiece but the world would never get to see it come to fruition unless I listened intently to him and wrote it upon awakening. The only thing that remembered when I woke up was that he'd told me a terrible story that I couldn't follow. It had a lousy beginning and no end. Still wish I remembered it though.